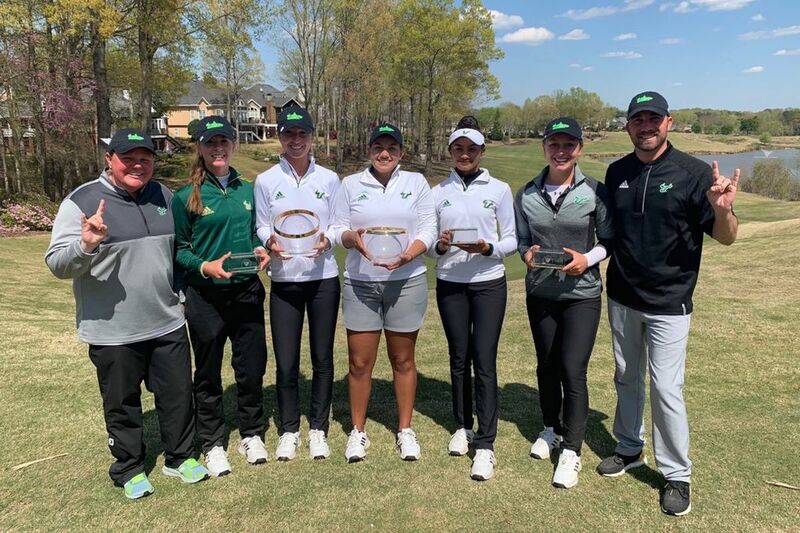 USF women’s golf completed the comeback at the John Kirk Panther Intercollegiate today to claim their second team title of the season with a 26-over 890 at Eagle’s Landing Country Club in Stockbridge, GA. The Bulls got off to a terrible start in the tournament by carding a 15-over 303 in the first round to put themselves 12 strokes behind Murray State. Senior Natalia Villavicencio and freshman Ramya Meenakshisundaram each shot even-par on the back nine to each card a 2-over 74 to help the Bulls from falling out of contention on Sunday. Moving Day Monday saw the Bulls shoot up the leaderboard with a 5-over 293 (20-over for the tournament) and get into a tie for first place with Murray State after the second round. Villavicencio shot an even-par 72, while senior Jacqueline Twitty and junior Sadie Dewinton-Davies each shot 1-over 73. In what was a competitive tournament at the top quickly turned into a laugher as the Bulls turned a tie into a 22-stroke victory. Twitty carded an eagle on No. 6 and never looked back on her way to a 2-under 70 to lead USF on Tuesday. She finished the tournament in third place at 4-over. Villavicencio carded another steady even-par performance to claim the individual tournament title, her second of the season. As a team, the Bulls shot a 6-over 294 to easily cruise to victory as Murray State collapsed with a 28-over final round. The Bulls will now look to build on the success of this season at the American Athletic Conference tournament April 14-16 at Hammock Beach Resort in Palm Coast, Florida. #20Strong: Jacksonville First Coast WR Tyree Saunders Verbally Commits to USF Football The Bulls have begun to stockpile some offensive weapons for the 2020 class. #20Strong: Braden River RB Brian Battie Verbally Commits to USF Football That’s three 2020 verbals for the Bulls in five days.